The Limited Master license may be issued to applicants to be employed by a marina, yacht club, formal camp or educational institution allowing the licensed person to operate an inspected launch in a limited area. Inspected launches will have a Certificate of Inspection (COI) stating number of passengers (usually more than 6) and area of operation. Uninspected launches carry 6 or less passengers and only require the OUPV Limited License. * A "day of sea service" is equal to 4 to 8 hours away from the dock. Certification: Upon successful completion (attendance and passing required exams), you will receive a New England Maritime Certificate of Training and a Boating Safety Certificate. 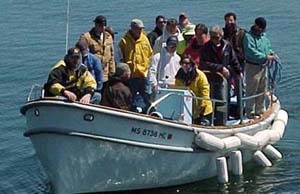 The Limited Master Certificate (expires one year from date issued) and the Boating Safety Certificate are then brought to the U.S. Coast Guard REC in Boston, along with your USCG Application to receive your USCG License. 2-DAY Course meets all day Saturday and Sunday. Cancellation Policy: Deposits are refundable if written cancellation is received more than 14 days prior to course start date, less an administration fee of $50 and the cost of books. Cancellations made 14 days or less from the course date will forfeit deposit. A student requesting a move to a future class will be assessed a $50 fee and cancellation policy will remain in effect as of original class date. A full refund if class size minimum is not met.